I came across this article whilst looking for reviews of the Acer 3D ready screen. I already have the Samsung 2233RZ in a 3D set up. BUT there is one big problem with these 120Hz monitors and Cyberlink dvd10 Ultra. 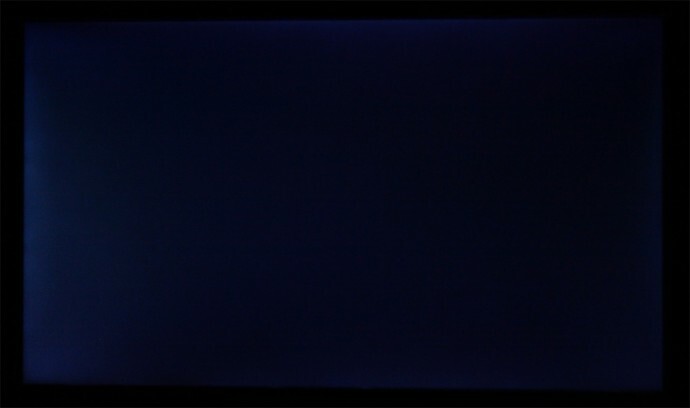 They will not play back Blu- ray unless reset to 60 Hz. Samsung are aware of this but Cyberlink do not want to know albeit their Mark II patch was supposed to be the answer. I don’t suppose this monitor is HDCP compliant at 120Hz is it? im curious to know how this would perform in comparison to my current moniter. I know my current moniter is a cheap piece of tat… its a CIBOX LE2262, will i see huge improvements over my current screen if i purchase this acer? Yes Alex, it should be better than your current LCD monitor and most likely not only because of the 120Hz mode and the option to use it for 3D content. Thanks for the response bloody. I wrote previously on 31st July that the Samsung 2233RZ was not compatible in Blu-Ray with Cyberlink Power DVD 10 Ultra Mark II. You can get over this by using ‘anydvd’ software but the problem lies with the Samsung which is only Blu-Ray compliant at 6oHZ. It has taken 3 months to get to this stage with Cyberlink seemingly unable to appreciate that only one monitor currently available will play Blu-Ray 3D. Well done ‘Novatech’ for being the first UK major supplier to confirm the 120HZ was available on the Acer. I know this is way past meaning anything, but the rainbow effect in video games is caused when the refresh rate and resolution are rejected, so to speak, by the monitor. I would get the rainbows in games while running at various refresh rates using odd resolutions like 1440×900 (due to performance issues). But, when I switched to resolutions fully supported by the monitor, the rainbow effect went away. If you set the resolution in game, you have to check on the monitor hardware menu to make sure that you actually are receiving that game setting. 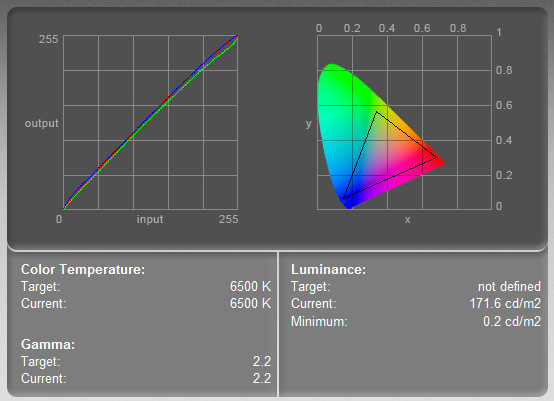 For example, if I’d chosen a resolution of 1440×900 @120Hz, the monitor would drop that down to 75Hz, and I’d get rainbows. But, when I set the game to 1440×900 @ 75Hz, no rainbows. And, it’s not just video games, you can recreate the issues in regular videos as well. I have a question about glasses. 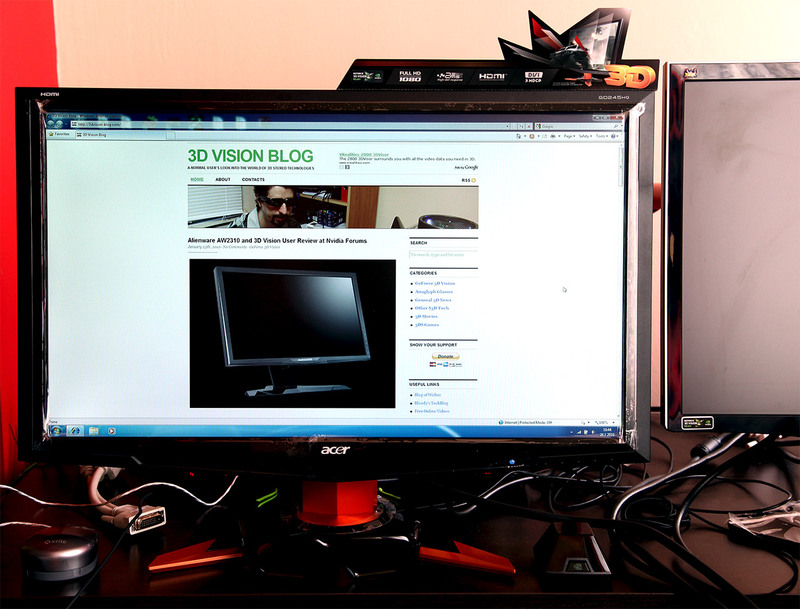 I’ve read about good comments on NVIDIA 3D Vision but I have ASUS ATI HD5870. 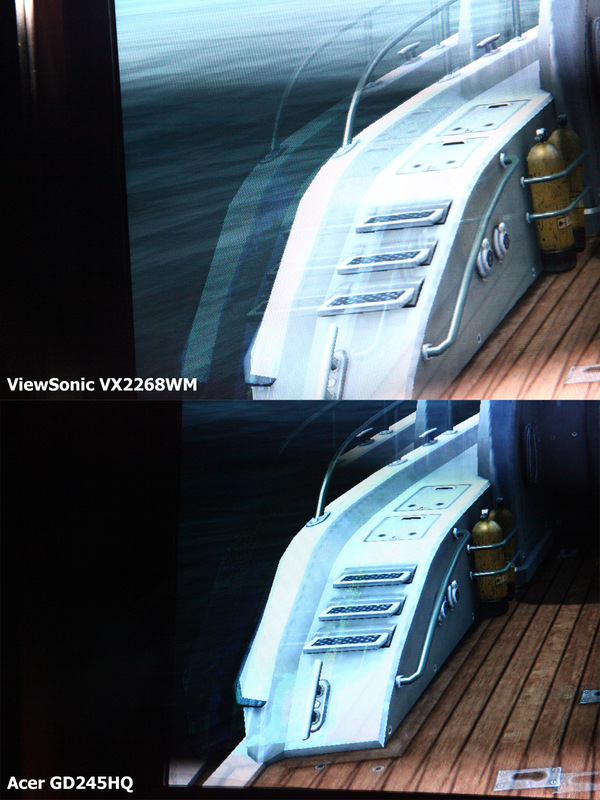 Is there any difference on viewing 3D with using NVIDIA product with ATI? I’ll be gaming most of my time so I need a good quality glasses. Do I need a specific brand of glasses or all work with my monitor? I have this monitor but don’t know much about 3D glasses so I needed to ask here. I’ve read about glasses are different from each other in terms of production technology, does this make any difference also? I have the Acer GD245, very good quality picture, like someone asked about connecting to Sky3d TV cable box, I tried same here, in AUstralia we call it Foxtel ( still same co as Sky) Wouldn’t do it either although as a 2D picture quality killed by older LG Plasma. Philby, the Acer is designed only for use with frame sequential stereo 3D content coming from the PC, you will not be able to use it with 3D-capable consoles, set top boxes etc. as these use the HDMI 1.4(a) standard for stereo 3D which is not compatible with the monitor. Hello Bloody, I have a little question, if you get some input lag switching other resolution which is not the native on Acer, if I use 800×600 on Counter-Strike (openGL mode) I’ll also get input lag or not… and will occurs on 22′ Viewsonic or Samsung with the same input lag? or less? Thank you so much. The 5850 supports stereo 3D, but not with the 3D Vision glasses and not with the Acer monitor… there is just one 3D LCD monitor compatible with AMD’s HD3D technology from Viewsonic that comes bundled with a pair of glasses that are supported. Hi bloody i am thinking to buy a monitor 3D witch one you recommend me for the best option Acer GD245HQ or ASUSVG236H? Did you ever find out what the red/green ghosting is caused by on these monitors? I have 3 of these hooked up to sli 480 gtx’s and all of them do the same thing, no matter what version of driver I’ve tried. I see it in games, and on videos as you describe. The faster you flick the mouse in games the more you see it. The best games to see it are Mafia 2 & Battlefield: Bad company 2. Thanks for quick response : ) Do you think it is worth to switch from CRT to this LCD? ;) I have my old Dell 17″, kinda small but can run 1024×768@100hz without problems and the colors are very close to perfect, if not perfect. Ive read a few of your reviews and appreciate the time you put into making them. Can you tell me which you prefer, acer aspire gd245hq or LG W2363D-PF? They’re both reasonably priced, and the LG is actually £50 cheaper, but im not sure which to buy. Any advice? Any other contenders in the same price bracket? Ill be using a GTX 460, will it be sufficient to play games in 3D at decent fps? The LG is clearly better, it is more recent and performs better – you can get zero input lag with the THRU mode activated and less crosstalk with it. Can get the LG for about 240 euro wich seems quite cheap, read that it comes with LGs 0 dead pixel policy, heard anything about that? Also got a couple of others questions if you dont mind :) can you disable the light display thing on the lower part of the monitor (cant see why they would put that on, seems rather useless)? Is there still no way to disable overdrive? i mean im gonna use this monitor for gaming and have another one for browsing etc but would be nice to not have to deal with the overdrive issues. Never owned a 120hz monitor, but when trying to sometimes use my samsung xl2370 to play a bit on its kinda pointless, theres quite alot of tearing wich i just cannot play with when im used to playing on a CRT, will a 120hz have that problem compared to a 60hz? Greetings everyone, just became a member of 3dvision-blog.com . I have spent five hours researching in the net, right until i’ve found this community forum! I think, I will be here for a long time. kool forum. I’ve been trying this monitor and i got horrorized discovering it does not support 800×600 / 1024×768 at 100Hz, 75 Hz max. How is it possible? that resolutions are the more common used in CS, quake, CS:CZ… Am i wrong? You noted in your test that the Acer was being run in a non-native resolution, which may account for additional input lag from needing to rescale the input. 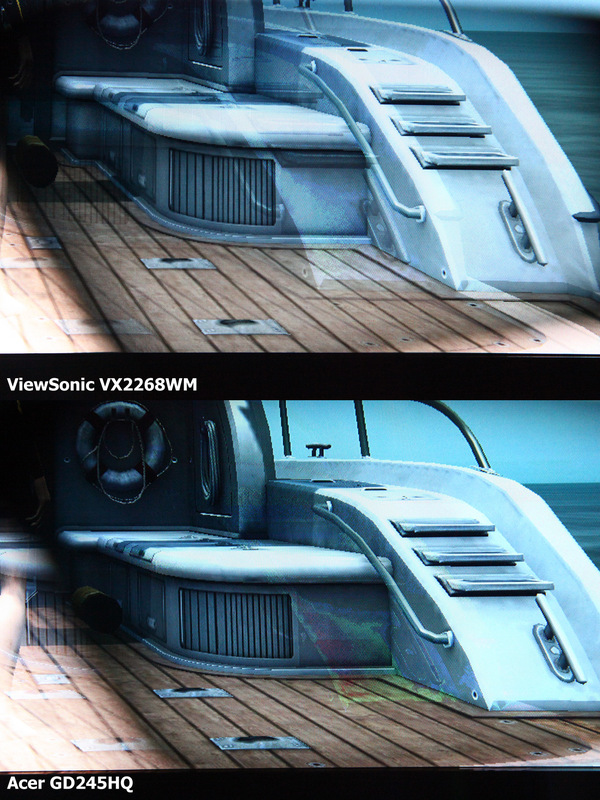 Have you tried running the test using the Acer’s native resolution instead and having the ViewSonic do the rescaling?